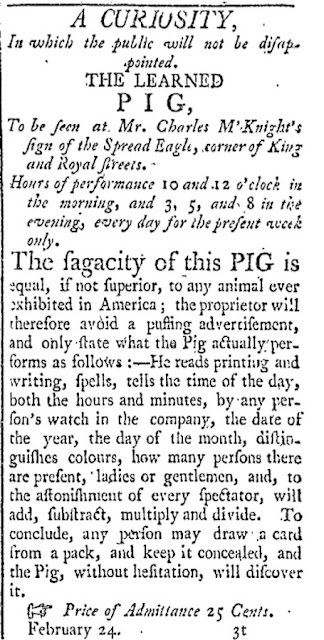 Having understood, through the kindness of the proprietors of Gadsby's Tavern and Museum, that there was a tradition of there having been a learned Pig at their establishment, I set in to searching the newspapers of the 1790's and early 1800's for any evidence I could find. And, although I have not yet located a Pig of these talents at Gadsby's, I have found one who appeared at Charles McKnight's Eagle Tavern, at the corner of King and Royal streets, on Febuary 24th 1801. The language is much that that in Mr. Pinchbeck's notices, but his name is not mentioned. Among Mr. McKnight's other entertainments over the years was one "infant Roscius" (buzz buzz!) who "will deliver in character a great variety of pieces from the British classics." There is a second, much longer notice, also in the Alexandria Advertiser, from June 27th of that same year, but this seems to be just a reprint of an account from Hudson, New York. The next local notice is for "The Learned Pig -- Now grown to be the Wonderful Hog," who appeared at Mr. John Bogan's, Spring-Garden, on December 11th 1806. And yet, alas, nothing for Mr. Gadsby; his only animal-related notices are from a series of 1797 ones for stray animals: "THREE COWS, Strayed or Stolen, marked as follows ... whoever will bring the above Cows to the City Tavern, Alexandria, shall receive eight dollars Reward, and all reasonable charges." All of which is not to say that Mr GADSBY did not possess a Learned Pig, only that if he did, he does not appear to have placed a notice in the Advertiser. Never the less, the list of Sapient Pigs displayed up and down the eastern coasts from Savannah to Newburyport between 1797 and 1806 is enormous; I've given some account of them in this post on Mr. J.L. Bell's excellent Boston 1775 blog, and I plan to survey the subject at far greater length in my Lecture to be given on the 20th inst. at the Gadsby Tavern and Museum in Alexandria, to which I would warmly invite any who are Curious as to these particular Pigs --or others -- to attend.